In the little that’s been shown of ef-a tale of melodies, it seems that the love stories will have a different nature and emphasis than the ones from season 1. The love stories in a tale of memories were about discovery, about people getting to know themselves as artists and their loves as other people. That’s appropriate when the protagonists are teenagers, very young people. Here, since the two male leads are adults in the story’s present time, it is more about how the girls past or present (and that contrast, I suspect, is deliberate–men and girls, more about that in a moment) are trying to help unravel the mysteries buried in the pasts of the men. The struggle is not so much about the fear of finding out something new and unpleasant so much as the fear of reopening old wounds and regrets. Regret seems to be a fairly common theme in a lot of the more serious anime that feature adults. I think of the main lead in Byousoku 5cm, which is in its entirety about how a man stagnates when he holds on to the “what might have been” in his life. The older characters in Honey and Clover, like Shuuji, had it. And if it’s not regret, it’s a passive emotional paralysis, and there seems to be plenty of that in this installment of ef to go around. Usually it’s expressed in denial: in Kuze denying that his violin is in fact perfectly fine and in burning his letters, in the young Yuu trying to willfully forget the tragedy at the orphanage. Speaking of which, there is, as in the first season, a fixation on imoutos with onii-chan complexes again. Once again there is a girl childhood friend (Yuuko) calling her love Yuu “Onii-chan” even though doing so pains him tremendously. (In this case he’s worse off than Hiro, who didn’t lose a real sister to a fire.) I’m cynical enough to think at times that SHAFT is, in a way, giving the artsy, refined take on what is otherwise a moe imouto fetish situation, the kind seen in plenty of lesser harem romances. 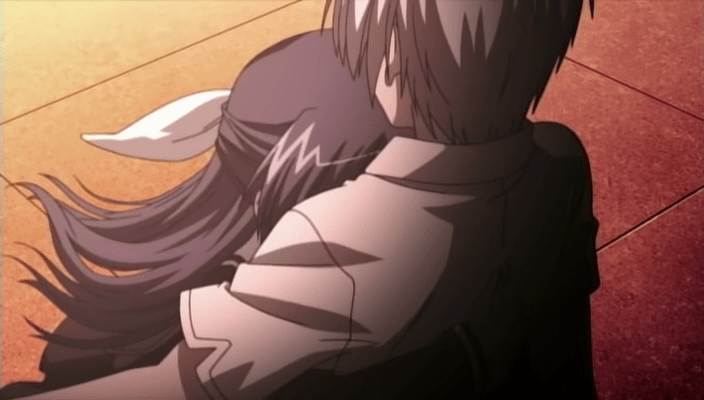 Mizuki is not really very different, though it’s not said in those direct words; she is the one here dressed in the nurse’s outfit, taking care of fainting Kuze by laying his head on her lap, assuring him she is there. She fits in a long line of Manic Pixie Dream Girls who exist to nurture creativity (violins and classical music), fun (cosplaying), and joy in a brooding artsy hipster men. And Kuze definitely has some sort of medical condition that makes him faint, as a proper sensitive Romantic-era hero ought to, complete with unsubtle comparisons between his heart and the slowing, unwinding metronome. 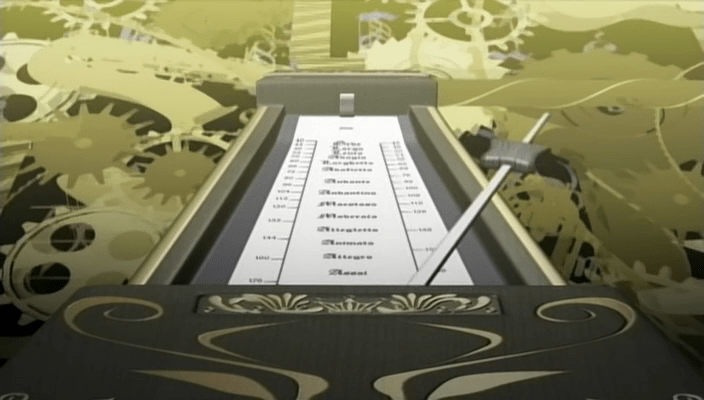 You know, I used to play to a metronome too, but it took SHAFT to make me see it as a metaphor for life! This all probably sounds like criticism of the episode, and to an extent it is, but only because it still has all of season 1 to live up to. 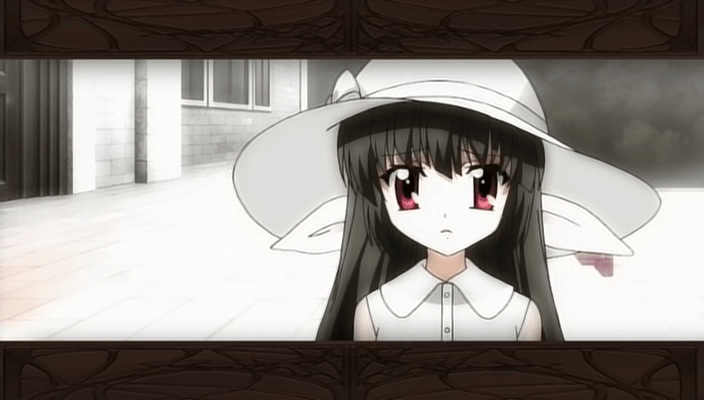 It’s a good time to remind myself that it was only on episode 2 that the first run of ef even began to warm to me, and only later that I really started thinking it was great. We certainly see the flashes that made it great: Mizuki’s honest and vivid description of appreciating classical music for the first time, the still-lovely use of color and shade to convey emotion. Contrary to some reviews I have read, I think it juggles the two main storylines well enough and without much distraction. I suppose there is a problem inherent in episodic blogging shows like these. One has to come up with an evaluation for each individual episode as it comes out week by week; often, shows simply can’t be judged fairly in such a piecemeal fashion unless it’s a deliberately episodic series. Maybe part of the pleasure is the fascination of watching my own opinions evolve in reaction to the show and to see whether any of my predictions pan out. Reading my very first reaction to Kimikiss is at once funny and embarassing, considering how much I ended up blogging and liking most of it. With ef, given the track record from before, I can generally expect a consistent level of quality in each episode and hopefully say something meaningful each time. I mean, I’m talking ’bout SHAFT, right? No worries, everyone. I can still dig it. Previous PostFace Off: Ray vs. Mike on KannagiNext PostDetroit Metal City 9 – Eat my fire spit!!!!!!! I’m starting to think that Jeff Lawson was onto something when he said he enjoyed A Tale of Memories more when he marathoned it; I honestly can’t say I think this is as good as that first season but I’m judging two episodes against a full run of twelve! As you say, it’s early days. The Kuze/Mizuki pairing does make me feel a bit uncomfortable but apparently their relationship in the game dosn’t pan out in a conventional way anyway (at least, so I’ve heard). That said, both romance threads in this series are in the realms of realism – I always found the Renji/Chihiro subplot to be a bit far-fetched.